Sidebar Convo - Contests, TV Console, Electric Guitar, WIA 2015, Stickers and More! Here is a quick shop update with a look at what's been going on in my shop. 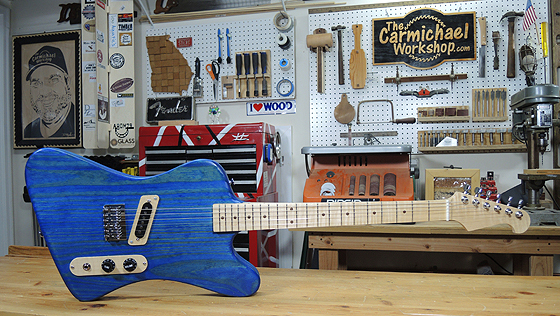 Get caught up on the latest contests, see the finished TV Console project, and take a peek at the Electric Guitar I'm building with the X-Carve CNC Machine! 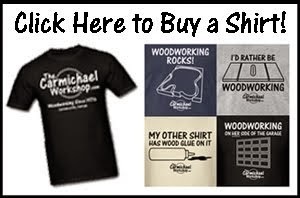 Buy a Carmchael Workshop T-Shirt! 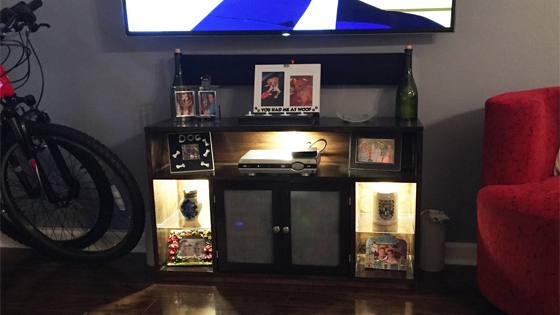 Make a Space-Saving TV Console Stand! 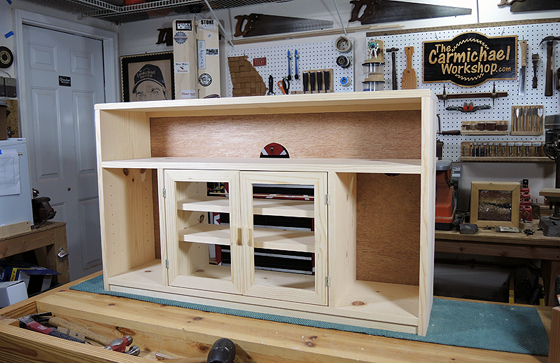 One of the greatest benefits of being a woodworker is the ability to create custom-size furniture to fit your needs. My friend needed a compact TV Console to fit in a small space in his condo, so watch my video to see how this custom project turned out. He provided a well-done measured drawing to help me get started. It contained the overall dimensions of the unit, plus the dimensions of the openings to house his electronic components. 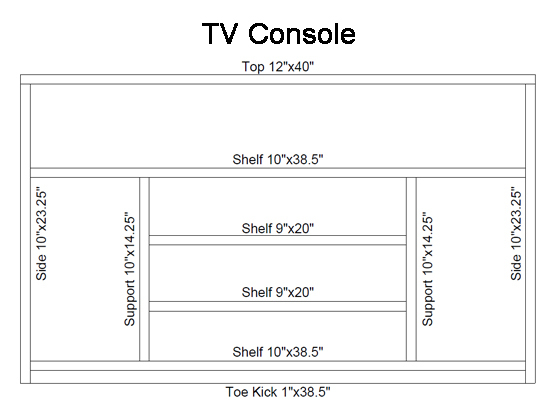 Using his drawing, I created this TV Console Plan and Cut List taking into account the thickness of the 3/4" lumber. 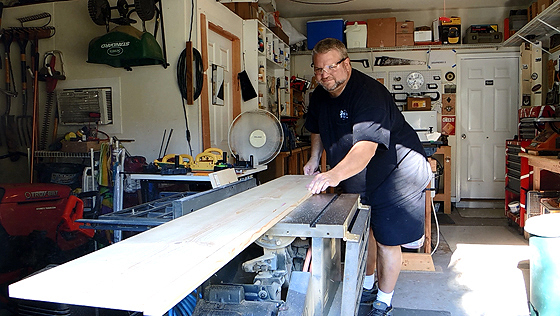 This entire project was built using three 8-foot 1"x12" boards and one 2'x4' piece of Luan plywood from the home center. The boards for the main unit were ripped down to 10" wide, while the top needed to be 12" wide to overhang the power outlet on the wall. Since a 1"x12" board is actually 11-1/4" wide, I attached an additional 3/4" strip to make it 12". I could have used pocket screws to join the unit together, but I thought the holes would be too visible. So, I used my old standby of screws with dowel screw head covers. 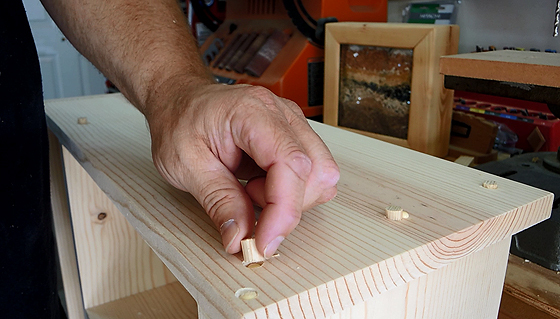 This makes for a strong joint, plus I like the look of the dowel plugs. I think the key to making this look nice is lining up the screws with equal spacing between them. The shelves in the bottom of the unit are adjustable. 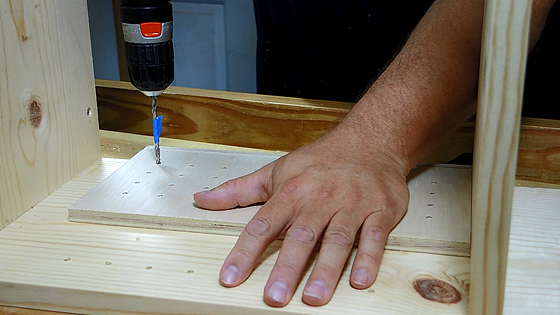 I made a shelf pin drilling jig to help quickly drill holes for the 3/16" shelf pins. This will allow for some flexibility when housing the electronic components. 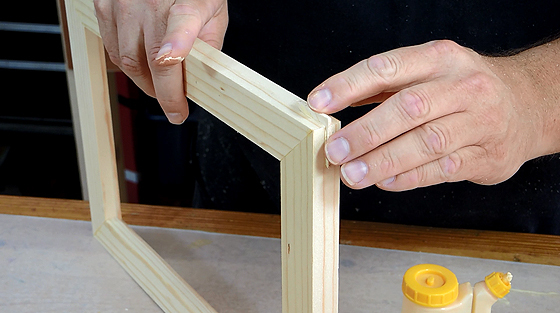 The doors are basically mitered picture frames with splines in the corners to add strength. My friend plans to insert frosted glass panels into the recessed rabbets on the inside. He also plans to put glass shelves one each side with lights which will look really cool. I made some handles for the doors, hung them on the console with hinges, and added a magnetic door catch. Now that the woodworking part is done, I have handed the project over to my friend to apply his choice of finish, as well as glass door panels and shelves. I promise to write an update on this project which he finishes his assigned homework. Thanks to my friend for requesting this fun project and having confidence in my woodworking skills! Update! Here is a picture of the finished project. My friend did an awesome job finishing it. Looks great!